Long, long time ago, when I started this blog, I already knew that, inevitably, I would end up talking about Sherlock Holmes. I don’t think there is any mention of him playing chess in the original stories,1 but he’s a detective. If the viewers have to believe that he’s a detective, you have to show that he’s smart – and if you want to show someone is smart, you show him playing chess. Today the day has finally come to face my unavoidable destiny and tackle the world’s most famous detective. We meet him in the 1959 version of The hound of the Baskervilles, being played by Peter Cushing and in turn playing the white pieces against no-one in particular. For those who don’t know the story: Holmes is called upon to protect Sir Henry Baskerville, who is thought to be in danger after his uncle, from whom he inherits, died under strange circumstances possibly related to an old folk tale about a curse on the family. 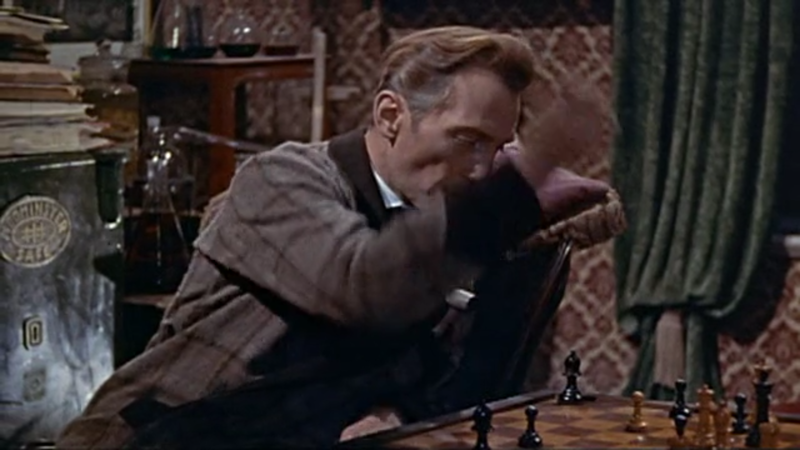 At first, Holmes can’t believe Sir Henry is in any real danger, as he is played by Christopher Lee, so instead he concentrates on chess. And this is where things get awkward. There was a bishop on a6. In this case, Rd3 would have prolonged the mate by at least one move. We must therefore discard this possibility. There was a knight on g3. Then black could have captured it with his rook, thereby giving a check. There was a rook or queen on f2 or e3. This implies that there was a promoted piece on the board. A white bishop was on h5. Here, Bf1+ would have delayed the mate. However, there is another small technicality to deal with: it’s possible that a black piece was blocking e2. If it was the bishop, the mate could again have been avoided for the moment. If it was the rook, Rxd2 would have prolonged the game. 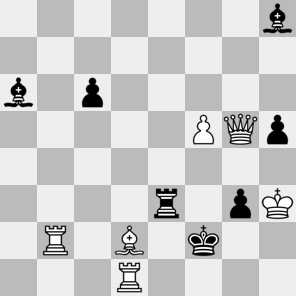 Unless black was in check by a bishop or queen from e3. Whence we can finally conclude that a piece must have promoted. Strange, indeed, but once you eliminate the impossible, whatever remains, however improbable, must be the truth. Realism: 2/5 It looks like a position that might occur between two terrible players. Probable winner: Holmes, as usual.